American actress and 4 time Academy Award nominee. 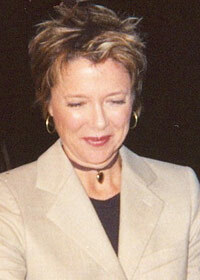 Her most notable films include American Beauty, Open Range, The Siege and Regarding Henry. Sue Barlow:"I've got a big idea about us, Charlie. And I'm not going to wait forever, but I am going to wait. And when you're far away, I want you to think about that, and come back to me." Sue Barlow:"So is it marriage that scares you two, or putting down roots?" Boss Spearman:"No. Who'd have him? All rangy and mangy like a rough old dog." Charley Waite:"How about I hold your head under water for just a little while?"